The Commonwealth of Virginia has almost completely excised all references to the murderous actions of early bands of Indian tribes against settlers (who were probably breaking treaties to settle in what was thought to be Indian lands or hunting grounds). Once historic markers in many of our southwest counties talked about “Indian Outrages” and “Murderous Savages”. Those have been removed. But some still share the stories of the raids, the kidnappings, scalpings, and killings that beset our pioneer families. Being kin to the Indians as well as the pioneers leaves one more than a little conflicted. So, I bring you one of the stories. An Indian (or Native American if you must), by the name of Benge, also known as Bench, and reportedly a “half-breed” (which historians report in a fashion that makes it sound like his genetics were the source of evil), with roots in the Cherokee nation, but who had traveled and taken upon himself the lifestyle of the Shawnee, became a leader in raids that happened in the area we know today as Wise, Lee, and Scott Counties, Virginia. He is reported to have stolen slaves and resold them, kidnapped children and women, scalped and killed men, and otherwise caused the wreaking of havoc in the lives of pioneers. In 1794, anger had arisen to a fever pitch in effort to stop these raids and related activities. 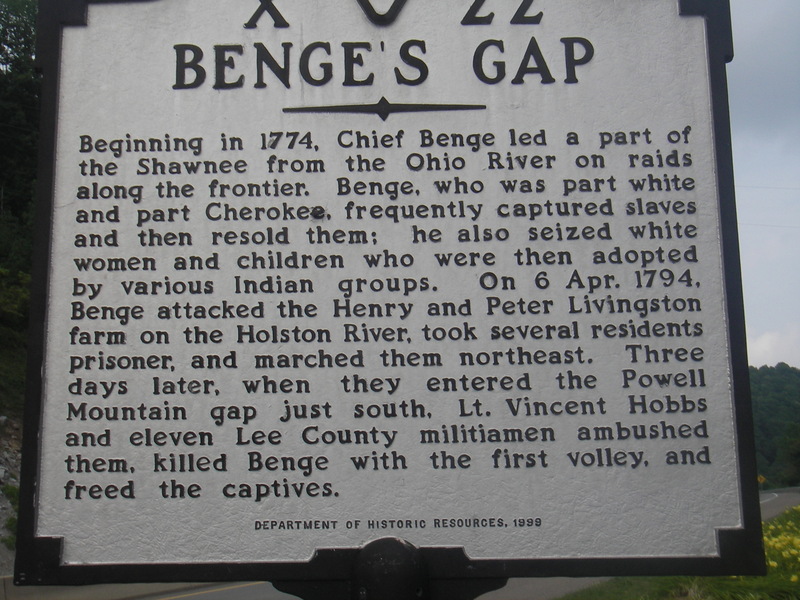 A group of pioneers organized and fought against Benge. They cornered him somewhere in Wise County, and historians differ on the exact location, some say it was near Appalachia, others say it was near Dorchester. But a gap exists on Powell Mountain above Norton, that has come to be called “Benge’s Gap.” It is thought this is where the fight broke out. A gunshot rang out, Benge died, and peace reined again in the hollows and hills. I just returned from a family reunion where my Uncle Bob told me, with a straight face, that his family grew up beneath the place referred to as Benge’s Rock. A rock outcropping exists at the top of the hill above this hollow where Grandma Miles lived. 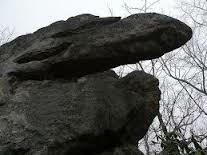 Legend has it that this was Benge’s Rock. The story goes, as my Uncle detailed it for me, that this is the rock where Benge was hiding when they were shooting at him. When the fatal shot rang out, Benge fell off the rock and where his body hit the ground, it is thought they buried his body there, beneath the rock. This entry was posted in Uncategorized and tagged Bench, Benge, Benge's Gap, Benge's Rock, Cherokee, Chief Benge, Indian, lee county, pioneer, rock, Scott County, shawnee, Wise County. Bookmark the permalink. Thanks for sharing Brad. I always enjoy information like this. Interesting story. I’m trying to figure if I am or if I am not related to this guy. I have mixed feelings about it LOL.